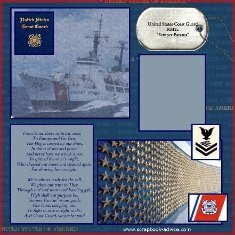 Here we have put together some Coast Guard Scrapbook Supplies in the Coast Guard Scrapbook Store to help you complete your scrapbook layouts for that very important hero in your life. Just recently updated our selection of Coast Guard products. Check our store below. Here I put together a Coast Guard Scrapbook Layout for a gentleman that had served in the Coast Guard during World War II. I did this for an album I put together for him after we went to the World War II Memorial in Washington DC on an Honor Flight. I did not have a photo of him, but I did get a photo of a Coast Guard Cutter at sea and printed it out to look like a watermark. 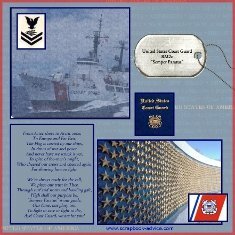 I added a small photo of the flag, used a Dog Tag and journaled name, rank and dates of service and "Semper Paratus" the Coast Guard motto translated as "Always Ready." For the small blue photo with the Gold Coast Guard Seal, I scanned the album cover and printed a small photo of it. I added a jounaling block on the left to put the words to the Coast Guard Anthem which I looked up on the internet. I used a Die Cut for the rank insignia and added that to the layout. The photo of the Freedom Wall at the WWII Memorial finishes out the Coast Guard Scrapbook Layout. Here is a small changes to the Coast Guard Scrapbook Layout, using the same elements, but with a photo matte for a photo of your own Hero. You can also replace the photo of the Freedom Wall with any photo that you might have available. Here in the Coast Guard Scrapbook Supplies Store you can purchase the items used on these layouts as well as the Album. If you would like to share your own layouts here, we would be most happy to post them if you will contact us through this Contact Us Form. In the Coast Guard Scrapbook Store, when you purchase from this page, you are actually purchasing from Amazon.com. All orders go through Amazon's secure order server.